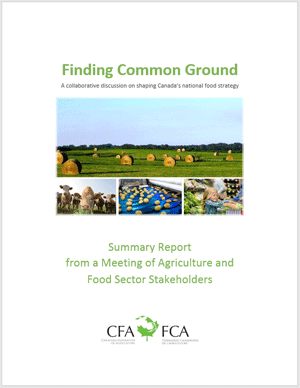 OTTAWA, June 21, 2017 – Leading up to the federal government’s summit on June 22-23 on creating A Food Policy for Canada, the Canadian Federation of Agriculture (CFA) today released a summary report from a collaborative session held earlier this month at which a range of stakeholders explored how Canada can work toward successfully implementing a national food strategy. CFA is pleased to see that the food policy consultation web site, which includes an online survey and links to previous initiatives from both governmental and non-governmental groups, refers to the Towards a National Food Strategy document published in 2011 by CFA. “Building on the work that’s already done in this area will be essential to success with such an ambitious timeline for the policy’s development,” said Bonnett. A focus on better coordination is also necessitated by the fact that agriculture and food policies are a shared responsibility among all orders of government. With this in mind, CFA looks forward to exploring the topic at its annual industry-government roundtable to take place in conjunction with this summer’s meeting of Canada’s federal, provincial and territorial agriculture ministers. Read the CFA summary report. See the A Food Policy for Canada web site.